Hydroelectric power is the production of power by using the gravitational force of falling or flowing water. Hydroelectric power is the most widely used form of renewable energy. Hydro power supplied an estimated 715,000 MW in 2005. This was approximately 19% of the world's electricity and accounted for over 63% of the electricity harnessed from renewable sources. Most hydro electricity comes from dammed water which is released to drive a water turbine and generator. The energy created by the moving water depends on the volume released, and on the difference in height between the water source and the turbine. The difference in height between the source and the turbine is called the head. The amount of potential energy which can be harnessed from the water is proportional to the head. To obtain very high head, water for a hydraulic turbine may be routed through a large pipe called a penstock. Pumped storage schemes produce electricity to supply high peak demands by moving water between reservoirs at different elevations. At times of low electrical demand, the excess electricity generated is used to pump water back up to the higher reservoir. When demand is high, the water is released back into the lower reservoir via a turbine. Pumped storage schemes provide the greatest commercial means of large-scale grid energy storage. Hydro power is considered to be a clean, renewable source of energy. It emits a very low level of greenhouse gases in comparison to fossil fuelled plants. Hydro power has a low operating cost and can be highly automated. Power is generally available on demand as the flow of water can be controlled. Using hydroelectric power also has disadvantages. Dams can block fish passage to spawning grounds. Many plants now have measures in place to help reduce this impact. The diversion of water can impact stream flow, or even cause a river to dry out. This leads to degradation of both aquatic and streamside habitats. Hydroelectric plants can also have an impact on water quality by lowering the amount of dissolved oxygen in the water. In the reservoir, sediments and nutrients can build up and the reduced water flow can create undesirable growth and spread of algae and aquatic weeds. There are incentives for hydro facilities to reduce their environmental impact. One such incentive is green power certification. The Low Impact Hydropower Institute (LIHI) created a voluntary certification program where hydro plants are classified as low impact once they have passed a number of tests that demonstrate minimal impact. In 2007, less than 30 facilities in the U.S. had that distinction. Certification programs, like the one offered by the LIHI, benefit hydropower companies by attracting consumers concerned about energy source impacts. While the use of hydroelectric power is an attractive alternative to fossil fuels, the technology must still overcome obstacles related to space requirements, building costs, environmental impacts, and the displacement of animals and people. There are alternative hydro options which are becoming increasingly popular as we strive to minimize our impact on the environment. Hydroelectric plants with no dam or reservoir capacity are called run-of-the-river plants, as the do not store water. Damless hydro is a less common type of hydro scheme. It uses the kinetic energy in flowing water to create electricity. This method is being regarded highly as the future for hydroelectric power from river systems. We will finish up with the video above. 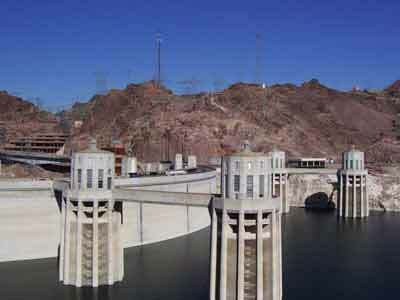 It shows the Hoover dam - one of the world's largest and oldest hydroelectric power facilities. When it was first built on the Colorado river, it supplied most of the electricity for the city of Las Vegas. Due to it's huge growth, Las Vegas now derives most of its energy from other sources.